Alma Natural Spa - Is Nail Polish Organic? The majority of polishes on the shelf are chemical solvent-based products that have been linked to cancer as well as other health problems. However, a small (but growing!) number of companies offer polishes that are based in water instead of chemical solvents. A water-based polish like Acquarella* is 80% water and therefore avoids most of the chemicals found in regular nail polish. Water based nail polishes are the best choice for your health and the health of your nails. Switching from a regular mani-pedi to one that utilises a water based polish will actually moisturize your nails as some of the water in the polish soaks into the nail as it dries. Keep in mind that these polishes come with trade-offs in terms of application and longevity so be sure to ask! Years ago, these three chemicals appeared in nearly all nail polishes; however many brands have eliminated these toxic ingredients from their polish formula because of their harmful effects on our health. Avoid these whenever you can! Also known as dibutyl phthalate, DBP adds flexibility and shine to a polish. It has been linked to reproductive and developmental problems. Toluene helps the polish to dry smoothly and maintain its colour. Also suspected to be a reproductive and developmental toxin, this solvent can affect the nervous system as well. This is the chemical that causes dizziness and headaches after you’ve spent too much time with the brush and bottle of polish in hand perfecting your manicure! Yes, you read correctly. The same preservative no longer used in the medical field because it is a known carcinogen can also be found in some nail polishes. It is added to harden the nail but it can also cause cancer or irritation to the eyes, throat, nose and skin. 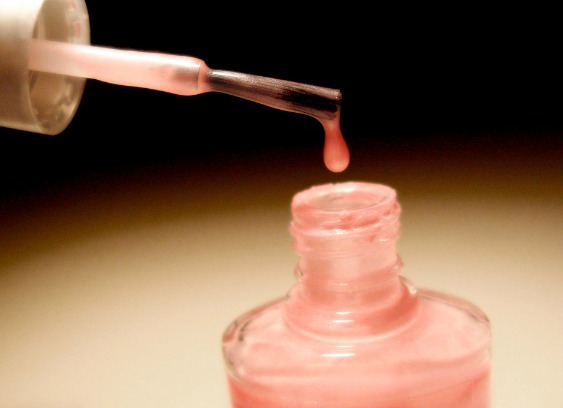 Another chemical you should be aware of when looking into natural nail care is acetone. This solvent (which means it is able to dissolve other ingredients) is the main ingredient in your everyday nail polish remover. This substance is very drying to your nails, can be irritating to the eyes and throat and should only be used in a well-ventilated area to reduce fumes. As an alternative to acetone based removers, at Alma we offer a soy based nail polish remover that is hydrating, non-irritating and smells great! Make sure to keep these tips in mind when purchasing a natural nail polish to satisfy that polish addiction and keep you and your nails happy and healthy! FYI: We get a lot of inquiries about vegan nail polish. The answer to your question is that virtually all nail polishes are vegan. A substance made from fish scales can be used to create shimmery shades but because it derived from animals and expensive to produce, most companies use the vegan alternative known as mica. Nail polish is generally free of any animal products, but if you are interested in animal friendly products, make sure to check that the company does not test on animals. At Alma, we currently use and have available for purchase, Aquarella & Zoya polishes in a selection of traditional colours and the latest favouries! Thank you for this very informative article. Keep 'em coming! I LOVE that I feel so healthy and well taken care of when I have my visits with you.